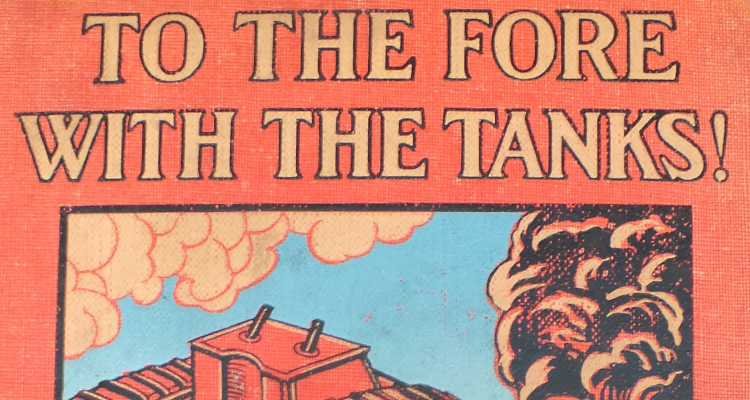 The Renault FT is by far the most well-known French tank of the First World War, but it was not the first Char d’Assaut used by the French Army. In 1917 the Schneider ‘C.A.1’ and the Saint-Chamond were sent into battle for the first time. Both served throughout the rest of the war, but they had a mixed record and were soon eclipsed by the FT. 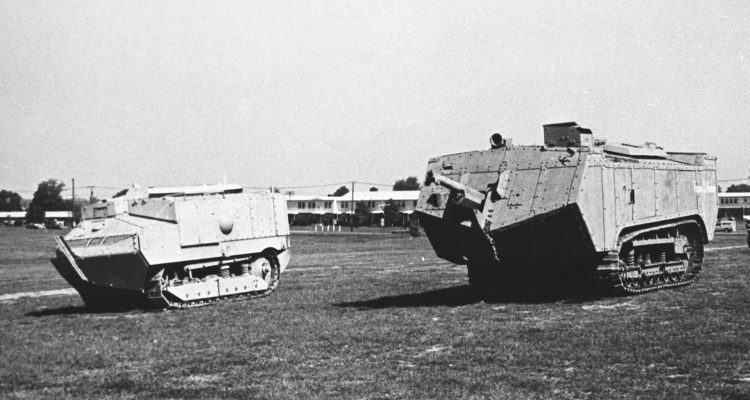 Both tanks were built on American Holt tractor tracks. They were developed during 1916 and approved for production in early 1917. The Schneider was ready first – in March the Army had 150 as opposed to 48 Saint-Chamonds. 400 of each were ultimately built. The Schneider weighed 13.5 tonnes and was 6m long, 2.5m wide and 2.39m tall. Its 60hp engine gave it a top speed of around 3 ¾ mph. It could cross a 5 foot (1.5m) wide trench. The six man crew operated one 75mm ‘Blockhouse’ gun mounted offset to the right and two 8mm Hotchkiss machine guns, one firing to each side. Armour protection was 19.5mm at its thickest. 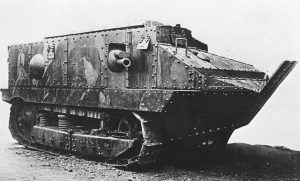 The Saint-Chamond was much larger, weighing 23 tonnes. Although almost identical in width and height, it was half as long again as the Schneider, at 8.83m. It could cross a 6 foot (1.8m) trench. Powered by a 90hp engine, it had a top speed of 5mph although this could be halved across rough country. It had a crew of 9, who operated a Model 1897 75mm gun and four 8mm machine guns. It was protected by up to 11.5mm of armour. 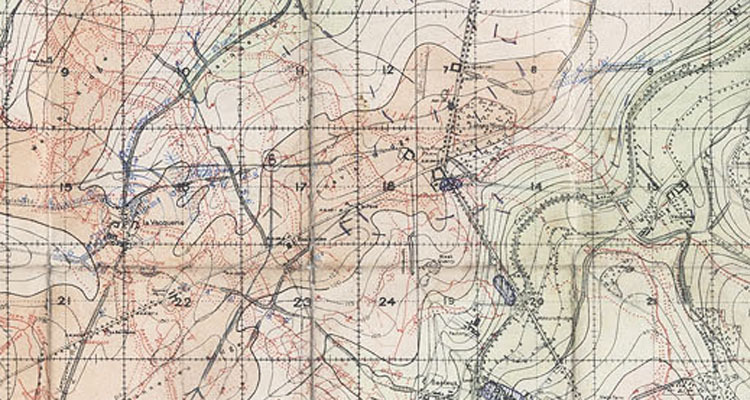 The Schneider was first into action, at Berry-au-Bac on the 16th April. A total of 121 were deployed in support of the infantry. 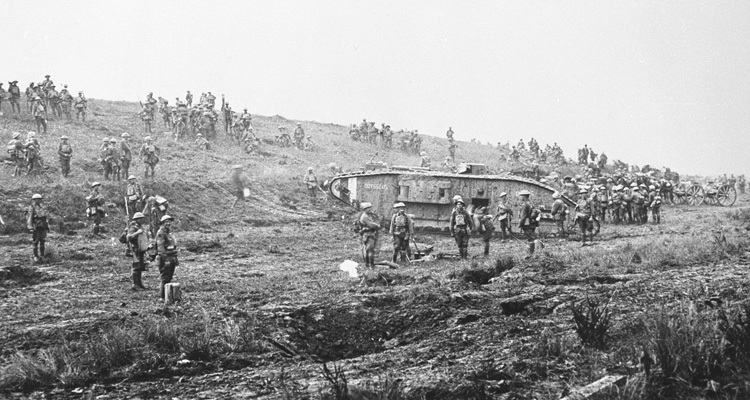 The Saint-Chamond was first used on the 5th May at the Moulin de Laffaux. Twenty-two (along with 19 Schneiders) took part. These early experiences highlighted flaws and shortcomings in both vehicles. 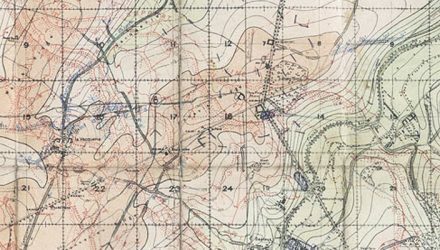 They had no suspension and were hot, dark and noisy inside, factors which along with the exhaust, cordite and petrol fumes made conditions for the crew almost unbearable. Both tanks proved highly vulnerable to German artillery and armour piercing bullets. The Schneider in particular was prone to catching fire when hit due to its unprotected petrol tanks and the crew’s tendency (soon forbidden) to carry extra petrol cans near the door. This practice also contributed to a high casualty rate, with many men unable to escape the flames. The Saint-Chamond suffered from poor mobility. It had prominent overhangs at the front and rear. If a trench was too wide these could get stuck in the parapet leaving the tracks turning helplessly in mid-air and making the tank an easy target. 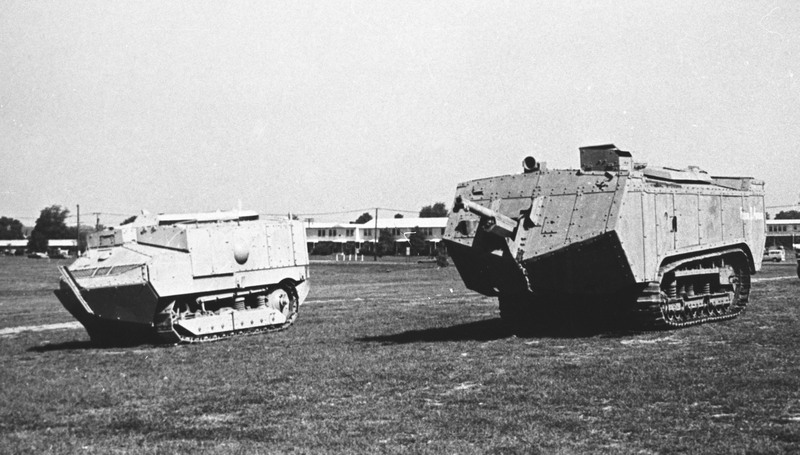 The shortcomings of these two tanks led the French to put their faith in the lighter and more versatile Renault FT. In diminishing numbers Schneiders and Saint-Chamonds soldiered on to the end of the war, serving alongside FTs in the mobile warfare of the final Hundred Days. 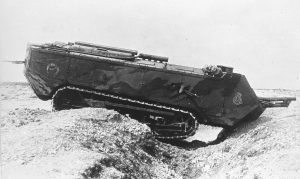 By the Armistice 308 of the 800 had been destroyed in combat, many had been withdrawn due to mechanical failure and a lack of spare parts, and no more than 200 still existed. 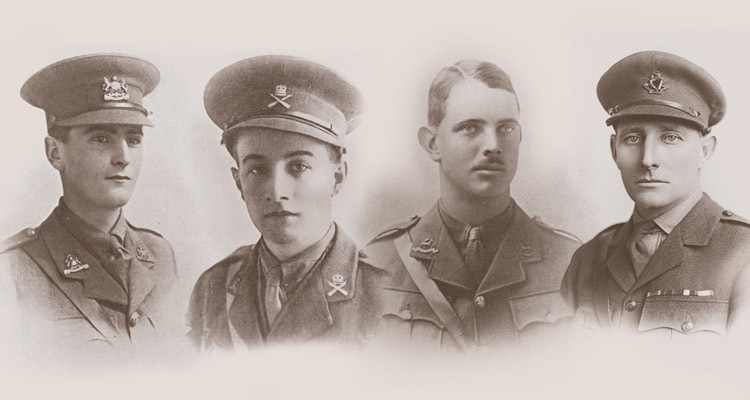 At the centenary of their service, just one of each survives. The two surviving tanks are visible at the museum at Saumur http://www.museedesblindes.fr and there is a full size reconstruction of a St Chamond at the museum in Péronne.